There are four main areas of Granite Moorland in Cornwall running from Land's End towards Devon, giving Cornwall a 'backbone'. Furthest west is the Land's End peninsula containing the West Penwith Moors, then Carmenellis lying in the triangle between Camborne, Helston and Falmouth. East of this is Hensbarrow or St Austell granite and then Bodmin Moor. 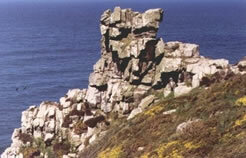 There are a number of smaller outcrops including the Isles of Scilly, St Michael's Mount and Carn Brea. Weathering of granite produces a typically rolling landscape of treeless heather and gorse covered moorland with large boulders lying scattered about particularly on slopes. These boulders are known as 'moorstone' and were used by our ancestors to build their quoits and circles, huts and hill-forts. More recently when the edges of the moorland was ploughed to make fields moorstones were used for hedging. 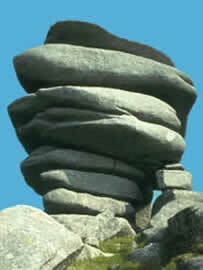 The highest parts of the moors are topped with rocky tors formed of resistant blocks of granite resting on each other. Examples from the Penwith moors are Carn Kenidjack, Watch Croft and Carn Galver. Most of the prominent tors are found on Bodmin Moor - Brown Willy, the highest point in Cornwall; Rough Tor near Camelford; Caradon Hill with its TV mast and The Cheesewring. Cornwall owes its industrial past to its granite foundations. The two western areas of Land's End and Carmenellis produced what were at one time the largest copper and tin mining operations in the World. Henbarrow granite's weathering produced china-clay which superseded tin mining as a valuable industry still of importance today.